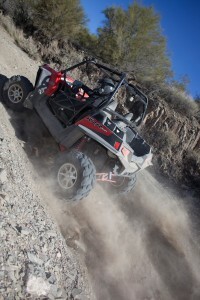 Coming into 2011 rumors surfaced about Polaris’s new RZR 900, to many (myself included), it sounded like a last minute effort by Polaris to compete against the new Can-Am Commander 1000, which out-displaced the RZR by 200cc. At best I expected a “Bold New Graphics” approach with a slightly bigger motor, and not much else in the way of improvements. 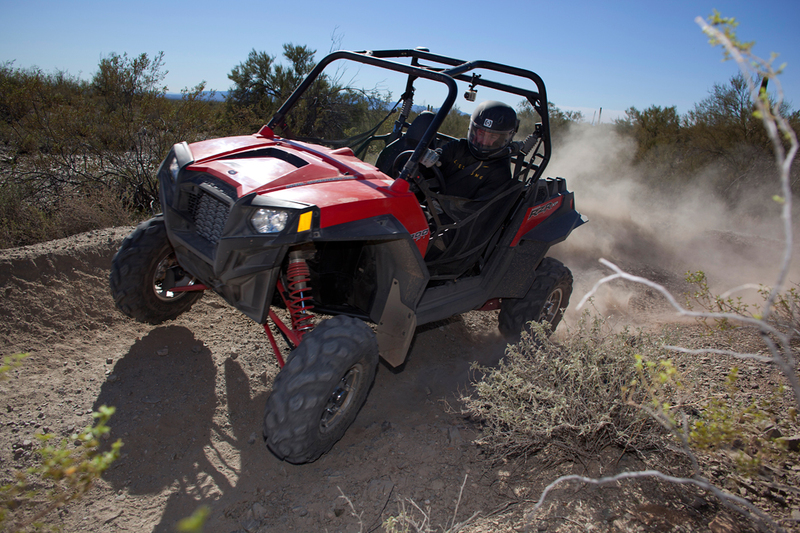 When we were invited to Phoenix by Polaris to test the new machine Britt Mansell and I jumped at the opportunity, after all, combined we own three heavily modified RZRs, and both feel extremely comfortable putting one through its’ paces. Even though Polaris officially released the machine prior to our test, I intentionally avoided reading anything about it in order to test without any pre-conceived notions as to how it might perform, or get sucked into the Manufacturer’s bullet points. Upon arriving in Phoenix, and catching my first glimpse of the machine, it became apparent that my “Bold New Graphics” theory was absolute garbage. 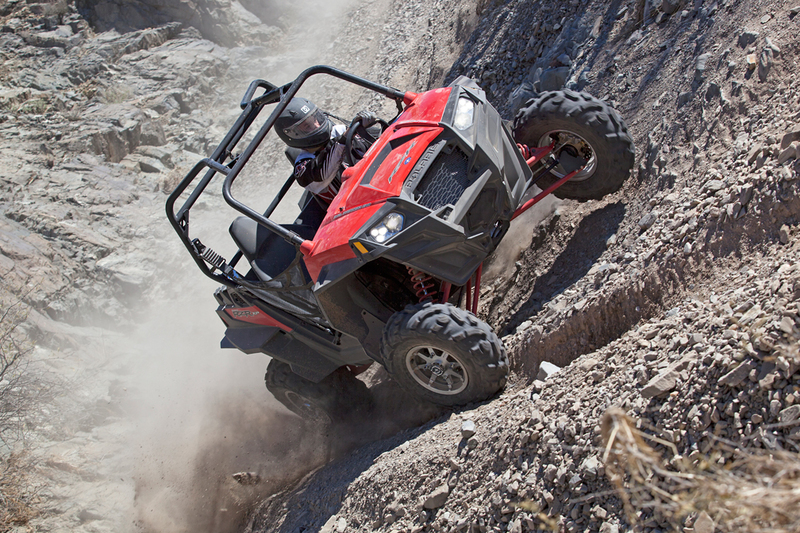 The RZR 900 XP was not only all new, but obviously not a last minute response to anything. In fact, the RZR 900 XP project has been going on since before the RZR-4 project was even released. Visually, the machine is impressive; it looks like a RZR-S on steroids, wider (64”), longer (4.5” longer than RZR-S), taller (13” of ground clearance) and just plain meaner looking. The most obvious differences at a glance are the re-designed front grill, and trailing arm suspension set up in the rear, which replaces the double wishbone on previous models. The not so obvious changes are all motor related, the ProStar 900 EFI Twin DOHC motor has four valves per cylinder, and a 750-watt charging system. Unlike online pundits had predicted, the motor is neither a Weber, nor Swiss Auto, it’s actually a completely newly designed 875cc Polaris motor. The cool thing about it, is that it’s the first time in UTV history that an engine has been designed for a SxS instead of using an ATV motor. 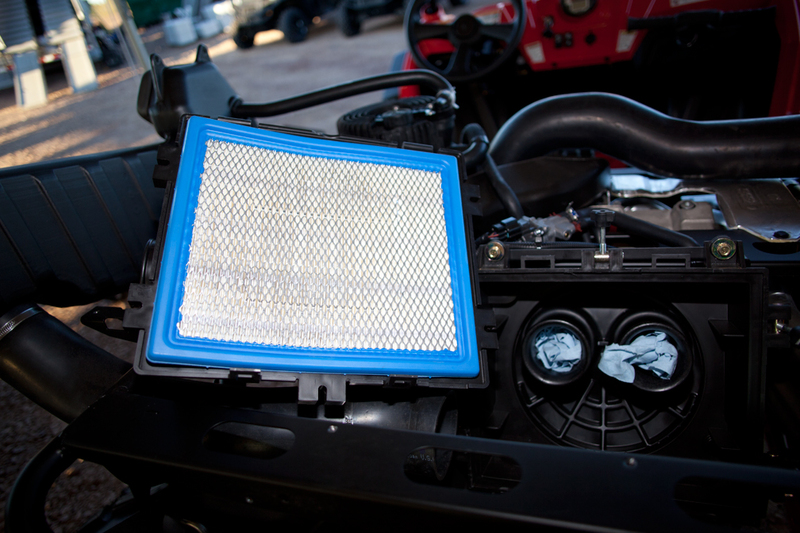 The 88 HP ProStar is a 2000-RPM faster revving engine, with 29% better acceleration. 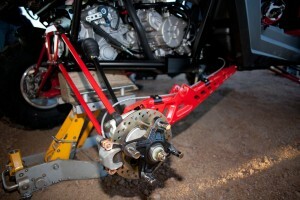 The engine is mounted sideways in the chassis with the exhaust routed out of the front. The exhaust routing allows for longer head-pipes which are not only more tunable, but sound way nicer than anything else on the market. 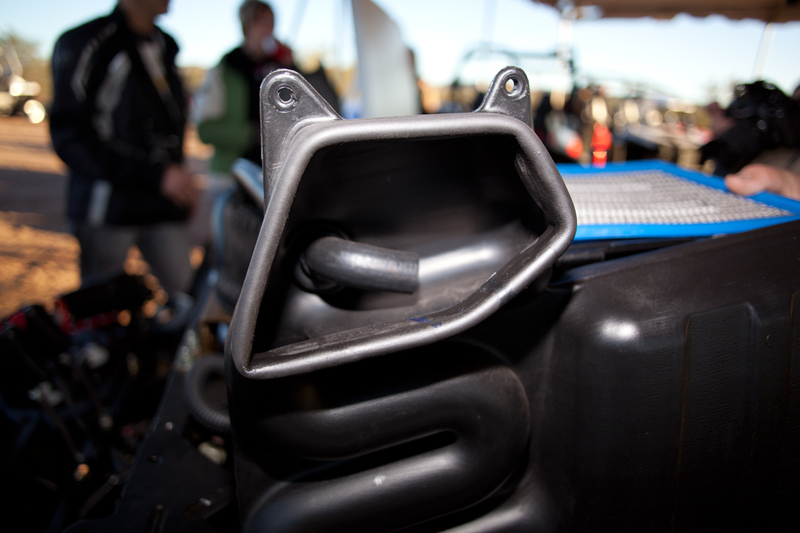 The RZR XP also boasts an all new airbox and filter with highly increased airflow over that of the original RZR thanks in part to 90% more filter surface area. 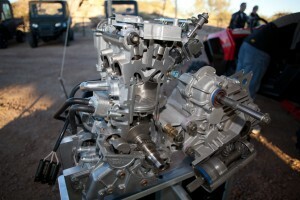 Dual 46mm throttle bodies round out the engine package. 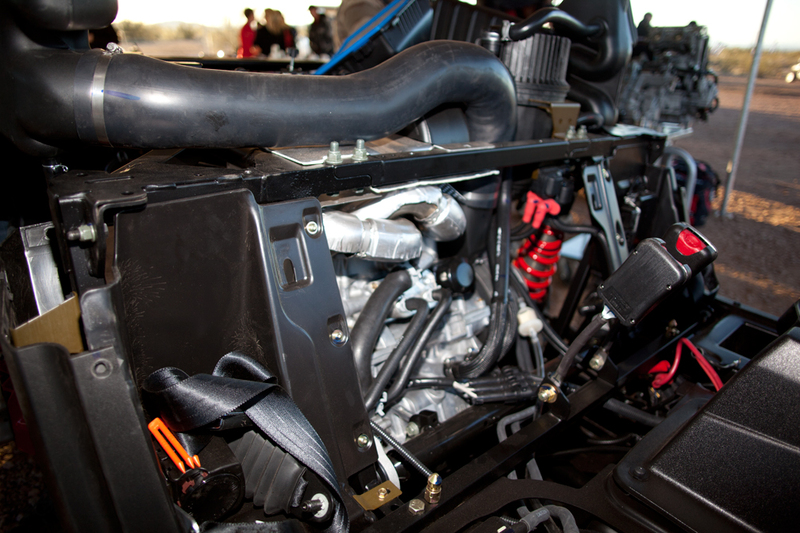 Clutch duties are handled by a zero lash drive system taken from Polaris’s Snowmobile line. 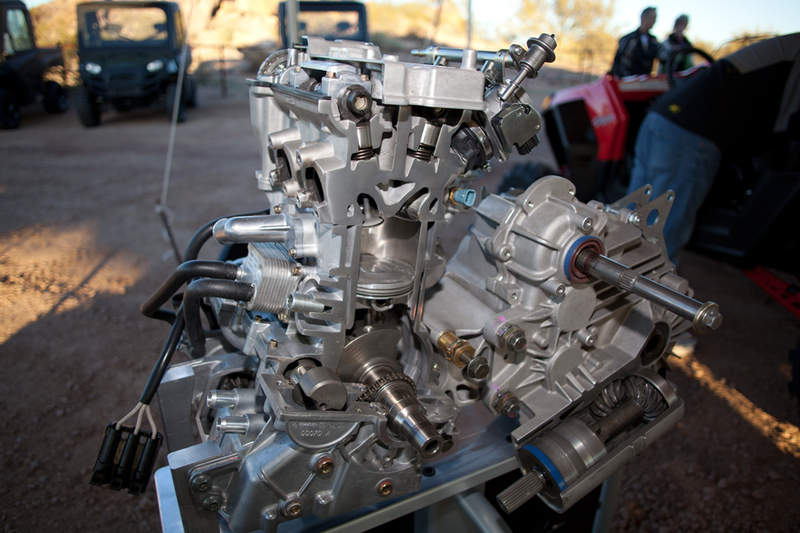 The newly designed transmission now has five shafts, weighs less than the original, and is noticeably more compact, but the real kicker is that it transfers 65% more power. The suspension on the XP is all new as well, with 13.5” of front wheel travel, and 14” in the rear via Fox Racing Shox 2” Body Podium 2.0 Reservoir shocks. 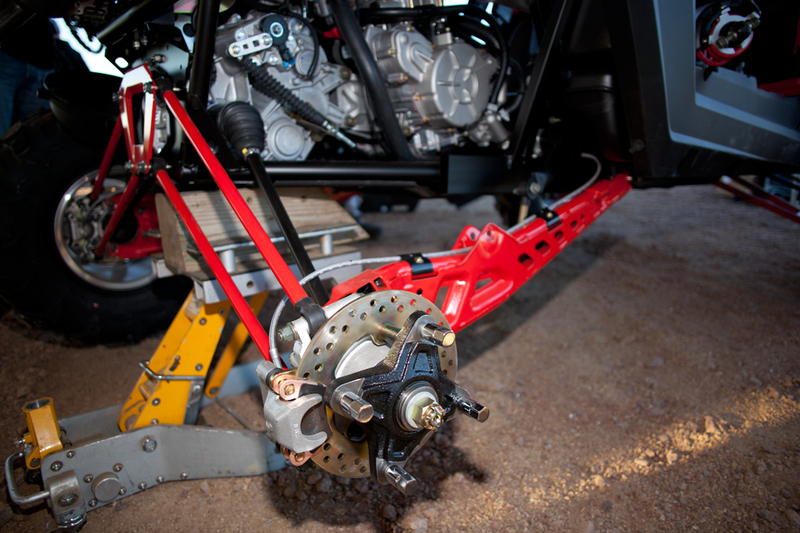 The rear suspension really is the standout feature, as the Three-link trailing arm long travel IRS system is straight up trophy truck worthy. The three-link system offers optimized camber control, which allows the XP tires to keep a wider contact patch, which translates to better traction. 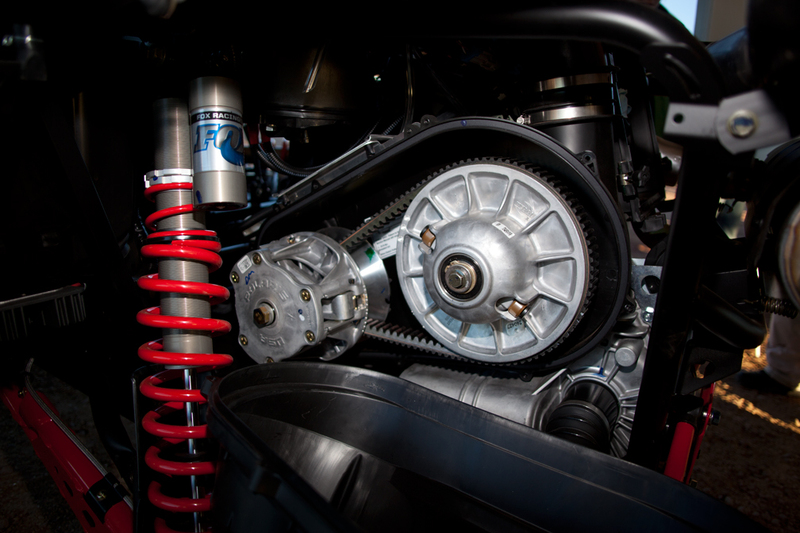 The entire three-link system uses spherical bearings all the way around, as opposed to higher wearing rubber bushings. All in all, the suspension provides an excellent feel, and delivers predictable handling. The steering rack is vastly improved over previous models with 22% faster steering. The XP boasts the largest brakes on the market resulting in 55% less effort required for braking. Other nice touches on the XP are the industry first LED headlights. 27” ITP 900 XCT tires, a high capacity air intake system, the rear access panels, and redesigned front grill. But what I’m sure you want to know is how it all actually works. Let me start by saying that Britt Mansell is an absolute animal when it comes to driving, the guy doesn’t really see obstacles and trail hazards as reasons to slow down, or even consider letting off the gas. With that said, Britt’s “Banzai Driving Style” was perfectly suited to the XP. The machine was not only happy to take anything we could throw at it, it actually begged for more. The 900 could be taken into high speed whoop sections at break neck speeds without the suspension ever wavering. The motor is sick, the XP has enough torque to require more driving technique than any of it’s predecessors, you can’t just mash the gas unless you want to tote the front end, and rocket into whatever you happened to be pointed at. We constantly found ourselves pushing the limits in order to try and establish where the actual “Edge” might be. Despite our best efforts, we never found it. No matter what we threw at the XP, it smiled, and begged for more. I would liken it to taking a swing at Mike Tyson, except without the consequences. The XP is just a different kind of animal, and for anyone who wants the feel of a trophy truck, without the 100K+ price tag, it’s the right machine. 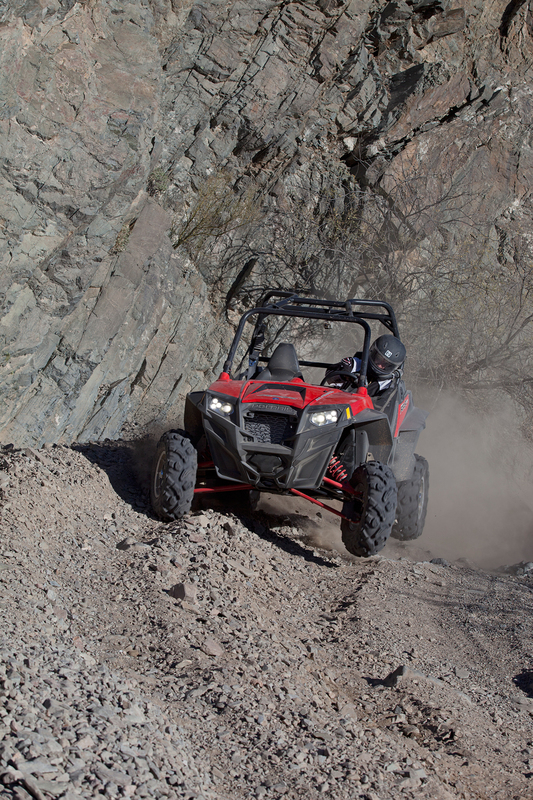 The XP stands for “X-Treme Performance”, and Polaris touts the machine as the perfect combination of Power, Suspension, and Agility. Outside of it being a catchy tagline, the XP actually delivers.